What is your favorite “green” building in New Mexico? According to the US Environmental Protection Agency, “green building” (also known as sustainable or high performance building) is the practice of increasing the efficiency with which buildings and their sites use and harvest energy, water, and materials. Those who use green building techniques also strive to protect and restore human health and the environment, throughout the building life-cycle of siting, design, construction, operation, maintenance, renovation and deconstruction. A number of organizations in New Mexico promote green building practices and design in our state. Each year, the local chapter of US Building Green Council develops the self-guided GreenBuilt Tour where you can learn about the sustainable features of local homes and buildings. 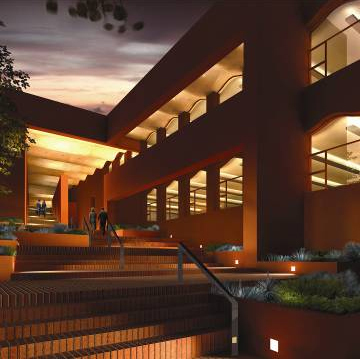 This featured green building is the Thornburg Campus in Santa Fe. 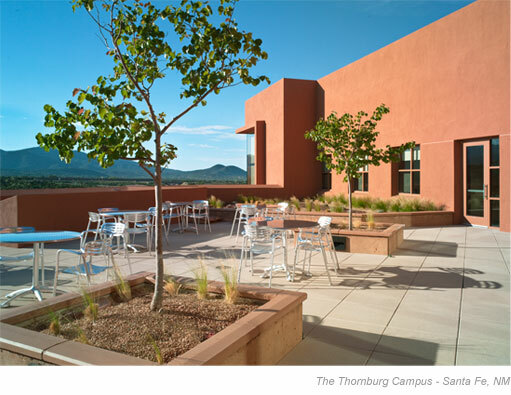 The building was designed to provide a sustainable and comfortable environment for Thornburg’s employees while taking advantage of the climate, daylight, and views of its Santa Fe location. The project was designed by Legoretta + Legoretta and Dekker/Perich/Sabatini. Do you have a favorite Green building in New Mexico? Post a comment below or send your favorite to NMarchitecturalFoundation@gmail.com. We’d like to share your photos on our Facebook page.